Guess what? Today we’re sharing about a famous American aviator who is still alive! He was the first man to fly faster than the speed of sound and made other historic flights. His birthday is February 13, 1923. Charles Elwood “Chuck” Yeager was born in West Virginia and spent his boyhood pursuing answers to questions about nature and basic technology. More interested in the outdoors and adventuring than school, he was an average student and graduated high school in summer 1941. 2. He started as an aircraft mechanic. In September 1941, Yeager enlisted for two years with the Air Army Corps and received training as an aircraft mechanic. With his familiarity working on car engines with his dad, these new skills were not too challenging. His first ride in an aircraft was less than ideal, but when the air corps adopted new pilot requirements, Yeager was intrigued and signed up. In 1943, Yeager began his pilot training and stood out to the instructors for his mechanical skills, amazing eyesight, strength, and ability to stay calm; these skills helped him secure fighter pilot training and in March 1943, he had earned his wings and joined the 363rd Fighter Squadron, 357th Fighter Group. 3. He flew combat missions in World War II. In December 1943, Yeager’s squadron headed to England and European Theater of World War II and by February 1944 he flew combat missions. During his eight combat flight, Yeager was shot down but managed to escape continental Europe with the aid of resistance fighters. 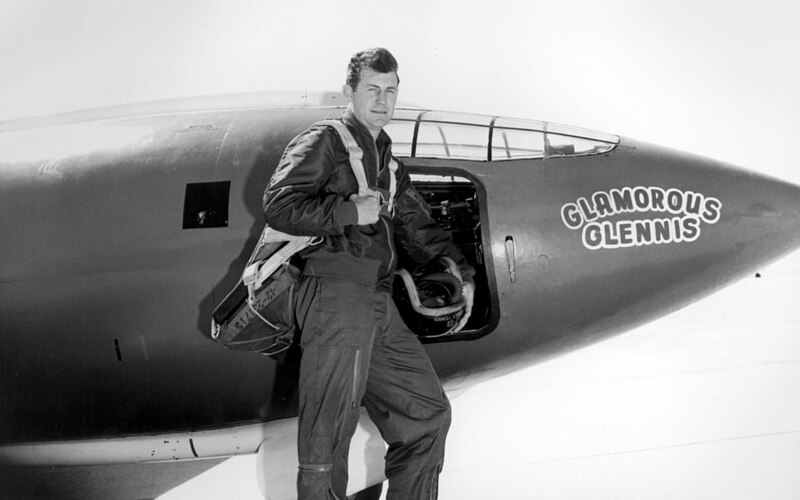 Flying several different planes – all nicknamed “Glamorous Glen” after his fiancee, Glennis – Yeager logged 12.5 aerial victories, 64 combat missions, and 270 flight hours. 4. He became a test pilot. After the war, Yeager worked as assistant maintenance officer at Wright Field, Ohio, where – as part of his job – he flew almost every fighter plane at the field. Others noticed his pilot skills and assigned him to fly at air shows and to test fly the P-80A Shooting Star which was the U.S.’s first operational jet fighter. 5. He was the first man to break the sound barrier. On October 14, 1947, Yeager left the launch aircraft in the X-1 and intentionally prepared to break the sound barrier, believing he had calculated and prepared to overcome the flight difficulties experienced earlier. That day he reached Mach 1.06 (700 miles per hour) in a classified military test flight; the following year when the record was declassified, Yeager became known as “The Fastest Man Alive” and numerous aviation awards. For the next seven years, he flew test aircraft at Edwards Air Force Base. Later, he flew the first MIG 15 (Soviet plane) to discover its capabilities and give U.S. pilots an information advantage about their opponent’s aircraft. On December 2, 1953, Yeager took the Bell X-1A into a climb, only leveling the aircraft at 76,000 feet and flying at Mach 1.9 before accelerating to Mach 2.44 (1650 miles per hour). For this record breaking flight, he received the Distinguished Service Medal. 6. He commanded squadrons and wings in the Air Force. In 1954, Yeager went back to operational command and was stationed in Germany and France, commanding 417th Fighter Bomber Squadron. Three years later, he returned to the states and commanded a unit flying tactical air command’s supersonic jets. 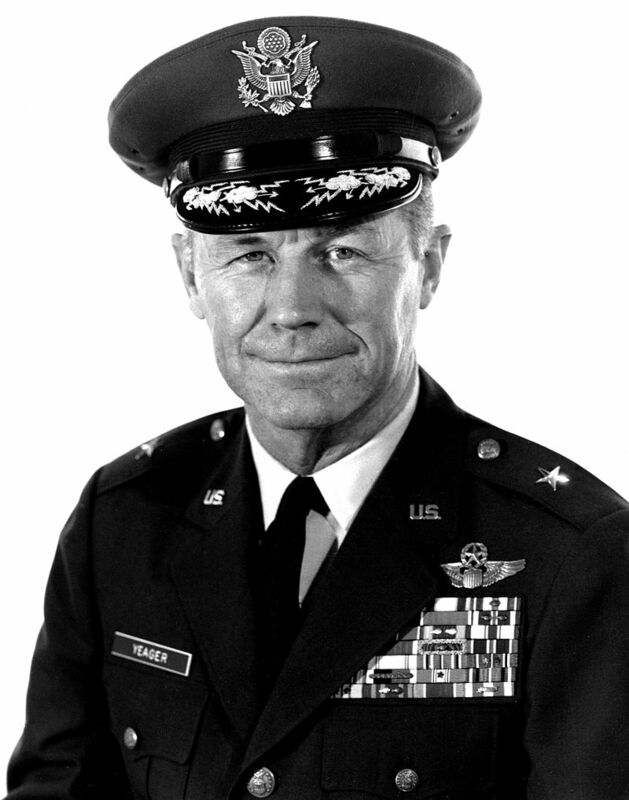 As an Air Force Colonel, Yeager returned to Edwards Air Force to serve as deputy director of flight test and in 1962 became commander of the Air Force’s Aerospace Research Pilot School which trained pilots for space flight. Yeager did not make a space flight, but his training and programs prepared a generation of American astronauts for their own record breaking flights. During the Vietnam Conflict, he commanded the 405th Fighter Wing and flew missions with the squadrons, adding 127 flights and 414 hours to his combat record. In 1969, he promoted to brigadier general. 7. He retired from the Air Force in 1975. February 25, 1975, marked Chuck Yeagers last official active duty flight. 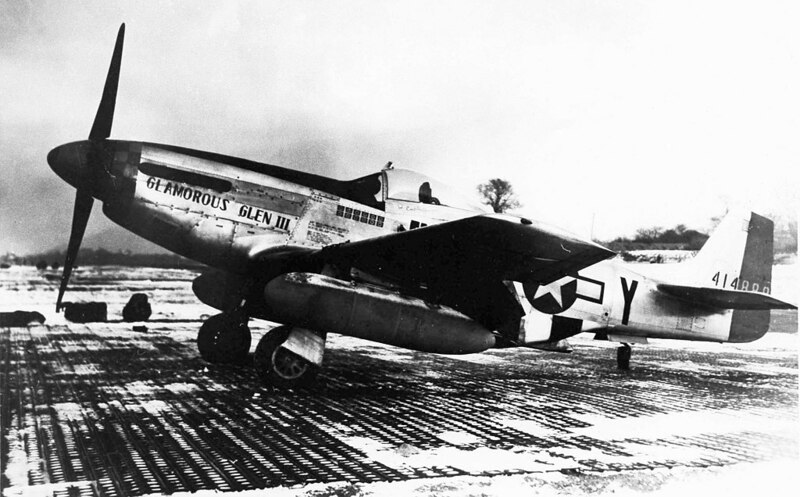 As he completed his Air Force service, he had 10,131.6 hours of flight in 361 different types of aircraft! General Jimmy Doolittle was among the officers and dignitaries who attended Yeager’s retirement ceremonies. 8. He appeared in a movie about his life. In 1979, the best-seller The Right Stuff appeared, detailing stories from test piloting and the early space missions. Already famous, Yeager’s popularity increased with the book release and later the movie version. Although an actor portrays Yeager in the film, the hero himself made a cameo appearance as a bartender in the production. 9. He was inducted into the National Aviation Hall of Fame. 10. He actively promotes aviation and leadership development programs. 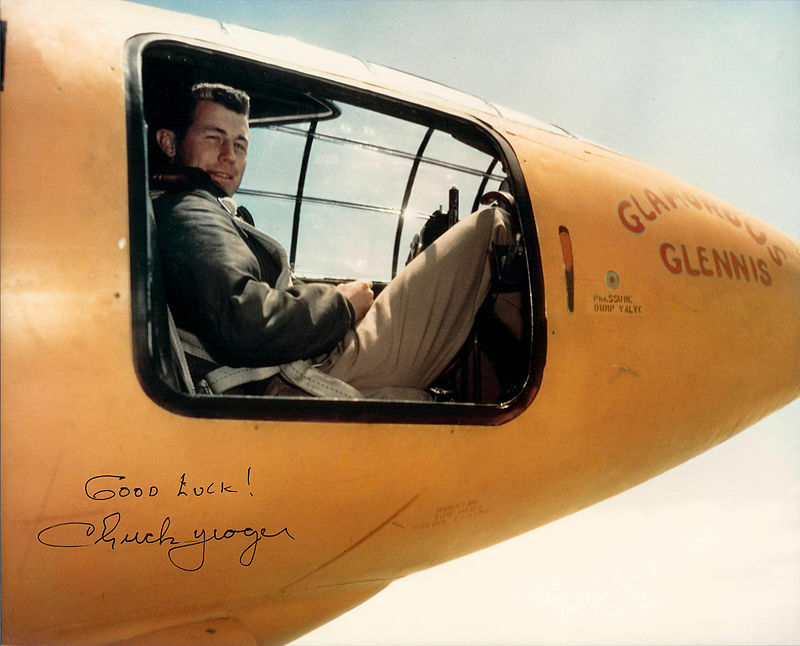 Chuck Yeager has continued to set aviation records and advise military test pilots in his retirement along with maintaining a schedule of public appearances and speaking. He has occasionally made supersonic flights on the anniversary of his achievement in new, modern Air Force aircraft! He has enjoyed hunting, fishing, and other sportsman adventures in the great outdoors as part of retirement.